The final train ride of our tour, on the Rio Grande Scenic, featured a photo runby in the snow at Fir. DENVER, Colo. — That’s a wrap. The fourth year of Trains tours of Colorado wrapped up Monday with our final train ride, from Alamosa to La Veta on the Rio Grande Scenic, followed by a bus ride to Denver and our farewell dinner at our hotel. Tomorrow, everyone flies home. The ride on the Rio Grande Scenic was a bit sobering because it took us through the path of the Spring Creek Fire, which closed the railroad, burned down its concert venue at Fir, and destroyed 140 homes as it spread across more than 100,000 acres. It was also more than a bit chilly. The train’s consist included an old friend — open-air, rear-platform observation car Lookout Mountain, which I first encountered too many years ago on a Southern Steam Special — but it was barely used on a cold, gray, windy morning, even by our hard-core group of fans. Most opted to stay in the ex-Santa Fe full-length dome where we were ticketed; a few others made their way to the adjacent former Illinois Central lounge cars, one of which was round-end observation Mardi Gras from the City of New Orleans. And when we stopped for a photo run-by at Fir, at about 9,200 feet, we did so in a fairly substantial snowstorm. It’s a trip that probably deserves a more prominent place on the railfan radar. The eastbound climb to the top of the 9,242-foot pass is pretty dramatic. But then, La Veta pass has always been a bit overlooked. Ed Ellis of Iowa Pacific, the Rio Grande Scenic’s parent company, noted that while the San Juan Limited, the narrow gauge train from Alamosa to Durango, was well documented, the standard gauge trains that brought passengers from Denver to Alamosa mostly crossed the pass at night and were largely overlooked. “We have very few pictures of passenger trains on La Veta Pass,” he said. So I think it was a pleasant surprise to many of our tour members. Several told me afterward how much they’d enjoyed it. I believe, based on the comments at tonight's farewell dinner, that they would say the same about the tour as a whole. 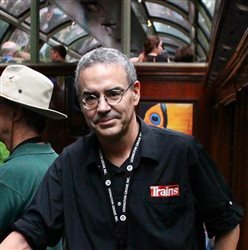 After eight tours in four years, we’re planning to give the Colorado package a rest in 2019, in part because of our focus on events connected to the 150th anniversary of the completion of the first transcontinental railroad.But we plan to offer it again in 2020, and I look forward to being part of it — and other Trains tours — in the future.